Pianisme is a collection of unreleased and out-of-print piano works composed and recorded since 2004. Most of them are part of soundtracks for feature films by french director Sébastien Betbeder (from 2007’s Nuage and the very rare short film Nu devant un fantôme – whose music was completely unpublished until now). Also released for the first time: In the twilight of Paris (written the day after Luc Ferrari’s death, as a quiet homage to a composer whose works have often been part of the Sub Rosa catalogue) and Soñando, straight repetition and variations on a minimal pattern, created for choreographer Christian Rizzo’s 2010 show L’Oubli, toucher du bois. This record is a previously unheard masterpiece of Israeli multimedia artist Ami Shavit. As a professor of both philosophy and art and established kinetic artist in the 1970s Shavit was fascinated with new and interactive technologies. While mostly focusing on visual art and mixed-media installations, a trip to New York in 1972 introduced him to synthesizers and triggered his curiosity to do some explorations into the world of music or “sound” as he preferred to call it. Ami’s research was focused on the concept of meditative music that would help people to relax and create a cosy mood associated to the alpha brain waves and biofeedback. Three recent electroacoustic works by Robert Scott Thompson: Nullius in Verba (2018), published by American Composers Alliance and featured on their new double-CD Currents, Breathing of Trees (2017) and A Wheel in the Pure Syntax of Steel (2018) were selected by international jury for the DIFFRAZIONI FESTIVAL 2019, Florence, Italy, 26th-31st March. Diffrazioni – Florence Multimedia Festival in Florence, Italy is a project dedicated to contemporary art, to explore boundaries between technology and poetic expression, where new tools, new scenarios meet with deep inner emotions. The project bases its strength on a system of synergies between institutions of higher artistic education, public administrations, young artists, cultural associations and non-profit organizations. Source: Atlas Studios, in Newburgh NY. Jazz at Atlas is thrilled to announce its 2019 season, all taking place in the gallery at Atlas Studios in Newburgh, NY. To launch J@A’s 2019 season, we’re proud to present the trio Thumbscrew. This cooperative project features a trio of gifted musicians and composers — guitarist Mary Halvorson, bassist Michael Formanek and drummer/percussionist Tomas Fujiwara — performing their own compositions and selected standards with an exacting prowess wed to a liberated swing that is glorious to behold. 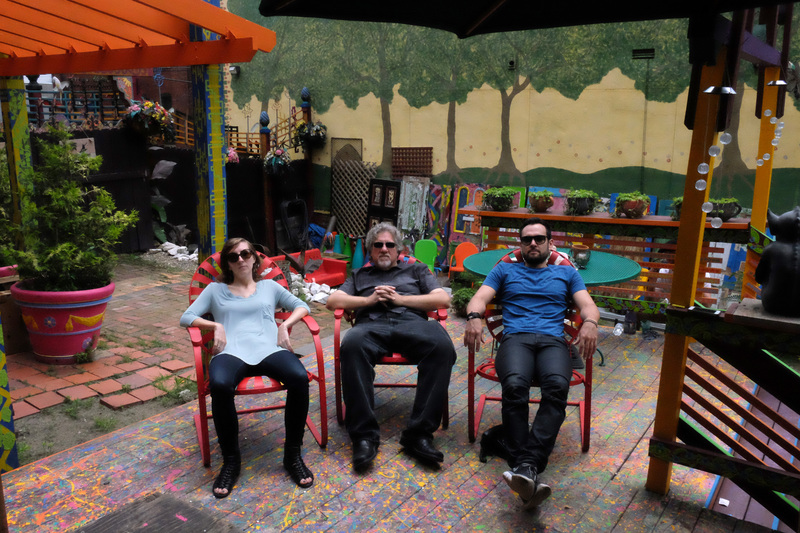 Thumbscrew performs on Saturday, March 30 at 8 PM. Tickets are $20 in advance and $25 at the door — advance tickets will be available at https://thumbscrew.brownpapertickets.com. Atlas Studios is located at 11 Spring St. in Newburgh, NY. Ample onsite parking is available. 4/20: Sun of Goldfinger — Returning to the Hudson Valley after their memorable closing set for the 2015 Beacon Jazz Festival, alto saxophonist Tim Berne, electric guitarist David Torn and drummer Ches Smith flatten any concept of musical boundaries in this forward-looking ensemble’s bracing embrace of the future unleashed within the present moment. The trio will be touring in support of their debut recording for ECM Records. 6/22: Ticonderoga — Four phenomenal musicians — Joe McPhee, Jamie Saft, Joe Morris and Charles Downs — invoke the spirit of late Coltrane and their own unique musical paths to forge a stirring, passionate fire sermon of a quartet. 7/27: Darius Jones’ Shades of Black — Called “the most visceral and distinctive alto saxophonist of this era” by The New York Times, composer/altoist Jones convenes a quartet of outstanding talents featuring Sam Newsome on soprano saxophone, Cooper-Moore on organ and Michael Wimberly on drums. 10/5: Karen Borca Quartet — The innovative, criminally under-recognized bassoonist, with decades of experience in the ensembles of such major artists as Cecil Taylor, Jimmy Lyons, William Parker and others, leads this thrilling quartet of veteran creative musicians including Warren Smith on vibes, Hilliard Greene on bass and Jackson Krall on drums.